Trussell Jones has a problem. He is crazy in love with a beautiful girl named Ellen. The problem? He has no car. His stepmother, who believes that she is spiritually connected to Queen Victoria, won t let him drive. Furthermore, she is afraid Trussell is trying to kill her. Not to be overlooked is the fact that Trussell is being pursued by a gang of armed redneck motorcycle hoods, while his neighbors are preoccupied with changing visions of St. Francis. Just another heartwarming tale of a boy in love with a girl? Hardly. This delightfully quixotic coming-of-age story, set in Columbus, Georgia in the 1950s, truly has something to shock and beguile even the most jaded reader. Its irreverent protagonist will take you on a road trip of hits, near misses, twists, and sudden turns that ll set you on your ear. You ll be unable to put the book down, until you reach its charming yet totally unpredictable conclusion. What’s the backstory, i.e., reason for writing, behind MEET ME ON THE PAISLEY ROOF? When I was in the seventh grade and later as a teenager, I was madly in love with a beautiful girl in my school who, I thought, viewed me as a pest. Civilized contact with her (as in a conversation), I reasoned, would lead to rejection so I did, as the sixteen-year-old Trussell did with Ellen in the book, "kicked up a lot of dust around her." Also during those years, I had wonderful friends with whom I shared many nocturnal adventures, problems in our family lives, and dreams about the future. I studied piano very seriously for a while and adored listening to the Classical and Romantic repertoire, if not on a record player, then in my head. Trussell tries to explain this strange habit to Ellen. So the story comes from a well of feelings about my teenage years: a seemingly impossible love, friends who love, support, and test one another, music that would send your soul soaring, and the utter frustration of having to deal with challenging events without having any experiences to fall back upon, emotions so intense, so alive, that I can feel them today, a half-century later. I wrote the book to share those feelings, expressed humorously, in a fast moving story. Although you've written textbooks, you've come to novel writing rather late in life. What prompted you to finally write a novel? I would prefer to change the phrase "rather late in life" to "later in life". That done, let me say that being a professor at a major university today requires one to be a writer in your areas of specialization. My fields were educational psychology and instructional technology, areas in which I did research, taught, and wrote -- research articles as well as books. fickle, and she requires large chunks of time before she will appear. No weekend gigs for her. I had to wait for retirement. 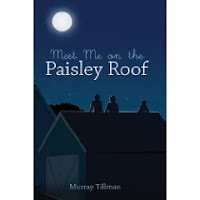 What was the most challenging part of writing MEET ME ON THE PAISLEY ROOF? That's easy. All of it. Why? It may be that my previous writing experience had prepared me to present information in a logical, orderly way. But, how do you, as novelists do, help the reader find a satisfying emotional experience as they read the text? Now that's a big one. To be more specific, I initially focused on character development and attention to details (be specific, the writing gurus say), the result being that I overwrote the scenes and neglected plot. At one point the manuscript soared to 127,000 words. Howard Berk, a former Hollywood scriptwriter and novelist at UGA, brought me back to earth. Not only did I trim 27,000 words, I had to write new chapters as required by my increased attention to the storyline. Later on, my wonderful editor, Gus Gedatus, helped me put the finishing touches on the entire story. My favorite character is Ellen. The reason is simple: my wife would kill me if I said anyone else. But hoping that she will not read this (Ha! She reads and edits every word I have ever written), let me tell you about Mr. Childs, a construction foreman. He is the father of Cassidy and Ronnie, teenage friends of the story's narrator, Trussell. Mr. Childs has the potential to be, as one of my friends said, a hero or a villain. Here is one quick example. Mr. Childs wants to show Trussell how it feels to fire a shotgun. So they go to the back of the house where Mr. Childs produces a loaded shotgun, then demonstrates how to hold the weapon properly, and then fires a blast out the back door into a large mound of dirt. And why was the large dirt pile there? Mr. Childs had, on his own initiative, recently bulldozed his wife's vegetable garden in order to build a fallout shelter. On one hand, Mr. Childs wants Trussell to learn about shotguns and acts immediately to "help" him learn. On the other hand, Mr. Childs is firing a deadly weapon within the city limits, easily alarming neighbors who hear the cannon-like noise that shotguns make. On one hand, Mr. Childs wants to protect his family from the devastation of nuclear war, but on the other he didn't discuss the matter first with his wife, who lost her garden. And so it goes with Mr. Childs, trying to be helpful to his family and Trussell, yet often skirting the limits of reason, if not the law, to do so. I write at a computer keyboard. Since I play the piano, moving my fingers across the keys is second nature to me. I prefer to write during the morning but am on call from my muse at any time. Once I sit down and start writing, I don't know when I'll get up. If I have written two or three decent pages by noon, that's great. If not, I'll take a break, and come back until by the end of the day, I have those two to three pages. My goal, then, is to produce two to three pages a day. But sitting down to write is not the only aspect of my routine. Visualizing before writing is also part of what I do. I usually try to visualize a place, a scene where the action occurs. In addition, I like to take a large sheet of paper and sketch out various actions of the characters. I draw lines, make circles, whatever it takes to focus my attention on what the characters might do and identify the nature of the conflict or connections being made. This is not quite an outline of the scene. It's just a rough map or sign posts for me. I don't know everything that's going to happen, and I don't want to. It happens when I write. Then, I find out. I have several different areas of interest in which I read, ranging from the air and naval campaigns in the South Pacific during World War II to early Christian history and, more broadly, the quest for spirituality. Let me stay within the fields of Southern literature and writing, however, to address this question. I grew up in Columbus, Georgia, in the shadow of Carson McCullers. She attended the same high school I did, although many years earlier. One of her English teachers was still teaching while I was there. I place McCullers three works The Member of the Wedding, The Heart is a Lonely Hunter, and The Ballad of the Sad Cafe at the core of my favorite novels. And yes, they epitomize to me what Southern writing is all about: all roads lead to the human heart. That journey involves trying to understand beauty in ourselves and in others and learning what truth this beauty, or its absence, conveys. On a more technical note about writing, I must cite the book by Brenda Ueland titled If You Want to Write: A Book about Art, Independence and Spirit. Her thoughts were really more about the nature of consciousness and creativity than the "act of writing." I could not have made the transition from a technical/scientific writer to a novelist without her. So how did I reduce a 127,000-word manuscript to 100,000 words? I tried to follow what longtime editor and author Sol Stein says in Stein on Writing, a book whose ideas can cut like a knife through the fudge of excess verbiage. His companion book How to Grow a Novel is equally informative. That last book, number six, I provide at no extra charge. Murray Tillman is a Professor Emeritus at the University of Georgia and formerly Chair of the Department of Instructional Technology in the College of Education. He has authored several texts that assist teachers in using instructional design tools and has developed training manuals and courses for businesses and human service agents. Murray is a graduate of Birmingham-Southern College and the University of Georgia. Visit him at his web site.